Seven Hawaii Army National Guard UH-60 Black Hawks and 47 soldiers were placed on three-month state active duty April 1 to provide air ambulance service on Oahu, replacing services normally provided by the active Army. Sgt. Duke Takasawa, left, Chief Warrant Officer Kaai Lincoln, Sgt. Garry Belen and 1st Lt. Ben Green sit in a Hawaii Army Guard Black Hawk helicopter, which has been outfitted with two litters. FIRST LT. Ben Green and his Black Hawk helicopter pilots were completing their 15 days of annual training when they got the call. It wasn't combat duty in Iraq or Afghanistan, but on Oahu providing emergency air ambulance service. Within two weeks, seven Black Hawks and the Hawaii Army National Guard's entire Bravo Company, 168th Aviation, moved from Lyman Field in Hilo to Wheeler Army Airfield. Half of the unit's members had to temporarily move to Oahu and are living in a hotel. The 47-member unit, one of the few Hawaii Guard units that hasn't been mobilized over the past three years for wartime duty, will be on state activity until July 1. Their job is to temporarily provide air ambulance service, which for the past 32 years was flown by helicopters from the 25th Infantry Division. The Schofield Barracks aviation unit is leaving this summer for Iraq along with 7,000 other 25th Division soldiers. The unit is expected to return in October 2007. In the meantime, the Army is trying to find a civilian helicopter company to provide emergency medical evacuation services for the remaining Schofield Barracks soldiers training here and on the Big Island's Pohakuloa Training Area. Maj. Gen. Bob Lee, state adjutant general, estimated the cost of replacing the Army's emergency aeromedical services for 15 months will be about $3 million. Lee said he hopes the state could use the same civilian aviation company that the Army hires. Several appropriation measures are pending before the state House and Senate, with the House version requiring the city to shoulder part of the financial burden. On Monday, the Hawaii Army National Guard aviation unit, using seven Black Hawks and six crews of four aviators and crew chiefs, started operating from 1 p.m. to 11 p.m.
Green, who has been a pilot for three years, said the hours of operations will be expanded on Saturday to 12-hour coverage a day -- from 11 a.m. to 11 p.m. -- seven days a week. GREEN, 25, said the Hawaii Army National Guard unit doesn't have the manpower or logistical support to provide round-the-clock coverage that the 25th Division unit has been doing since 1974 under the Army's Military Assistance to Safety and Traffic. For instance, they don't have kitchen or sleeping facilities like the Army does. For now, Green's unit has converted a conference room at the Hawaii Army National Guard's Wheeler aviation flight facilities into an operation headquarters and break room for its 47 soldiers. Green, who sells real estate as a civilian, said there is always one Black Hawk and a crew of four on the alert pad to respond to emergency requests from city paramedics, with another one on standby. However, unlike the Army's Black Hawks, which can carry up to six patients on stretchers, the Hawaii Army National Guard Black Hawks can carry only two litter patients. "The only medical supplies we will carry is what the city EMTs (emergency medical technicians) carry," said Sgt. Garry Belen, a Black Hawk mechanic. Sgt. Duke Takasawa, a Black Hawk crew chief, said three rows of seats were removed from the helicopter to accommodate two litters. The helicopter was further reconfigured to add a seat between the aircraft's two crew chiefs for the emergency medical technician. Also, the Hawaii Army National Guard Black Hawks aren't equipped with "Jungle Penetrators" -- a hoist with a 250-foot cable ending with a seat that can carry 600 pounds. Army aviators used the hoist in September 2004 to recover four bodies from a tour helicopter that crashed into the side of a Kauai mountain at the 2,900-foot level. "Basically, all we will be providing is air ambulance service," said Chief Warrant Officer Kaai Lincoln, who has been a Black Hawk pilot for eight years. 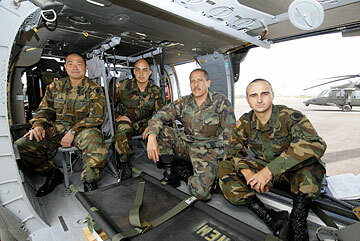 LINCOLN, a 1989 Hawaii Preparatory Academy graduate, said when the Hawaii Army National Guard Black Hawk unit was formed in Hilo in 1994, it had a medevac mission. Later, the mission was changed and the unit became an air assault company affiliated with an Alaska Army Guard regiment. Belen, a 1974 Leilehua High School graduate, said all the major maintenance operations will continue to be done in Hilo and mechanics like himself will work from 8 a.m. to 5 p.m. at Wheeler. For a crew chief, "the job is the same," said Takasawa, a 1989 Aiea High School graduate. "I will be doing the some thing no matter where we fly." For Takasawa, 34, this will be his first extended state active duty in the 17 years he has been in the Hawaii Army National Guard. "It's more like an extended annual training," said Takasawa, who normally works for the Army Guard as helicopter mechanic. Belen, however, said he is disappointed that his unit still hasn't deployed to Iraq or Afghanistan like other members of the Hawaii National Guard. Three years ago, Belen, who in civilian life is facility's manager for Honolulu Park Place, missed being part of the mobilization of the Hawaii Army Guard's 193rd Aviation because he had been diagnosed with cancer. "Since then, I have been given a clean bill of health, and I'm ready," Belen said. "It's time for me to pay my dues and I am ready."